FLIP: Select 1 Trap Card on the field and destroy it. If the selected card is Set, pick up and see the card. If it is a Trap Card, it is destroyed. If it is a Spell Card, return it to its original pos.. When this card is sent to the Graveyard as a result of battle, you may select 1 Dark monster with an ATK of 1500 or less from your Deck and Special Summon it to the Field (no Tribute is required for m.. 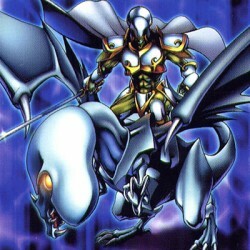 This monster can only be Ritual Summoned with the Ritual Spell Card "White Dragon Ritual". You must also offer monsters whose total Level Stars equal 4 or more as a Tribute from the field or your hand..
Destroys 1 Magic Card on the field. If this card's target is face-down, flip it face-up. If the card is a Magic Card, it is destroyed. If not, it is returned to its face-down position. The flipped ..